WebSocket allows you to set up long-standing TCP connections between your client and your server. This is a more efficient alternative to the old-school method which involved HTTP connections that were held open with a “heartbeat” for very long periods of time. WebSocket is great for mobile devices and can be used to deliver stock quotes, sports scores, and other dynamic data while minimizing power consumption. ALB provides native support for WebSocket via the ws:// and wss:// protocols. HTTP/2 is a significant enhancement of the original HTTP 1.1 protocol. The newer protocol feature supports multiplexed requests across a single connection. This reduces network traffic, as does the binary nature of the protocol. An Application Load Balancer has access to HTTP headers and allows you to route requests to different backend services accordingly. For example, you might want to send requests that include /api in the URL path to one group of servers (we call these target groups) and requests that include /mobile to another. Routing requests in this fashion allows you to build applications that are composed of multiple microservices that can run and be scaled independently. As you will see in a moment, each Application Load Balancer allows you to define up to 10 URL-based rules to route requests to target groups. Over time, we plan to give you access to other routing methods. Application Load Balancers can perform and report on health checks on a per-port basis. The health checks can specify a range of acceptable HTTP responses, and are accompanied by detailed error codes. 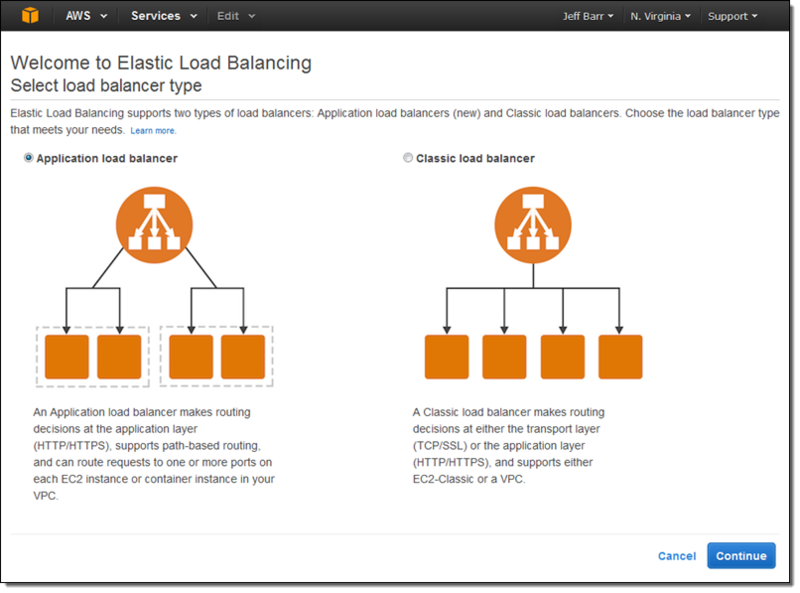 This entry was posted in AWS, Cloud, Computer, Murmuring, Network, WWW and tagged alb, amazon, application, aws, balancer, cloud, elastic, elb, http2, load, routing, url, websockets on August 12, 2016 by Gea-Suan Lin. You may be wondering about the drastic ASP.Net reduction in processing time compared to 2013 (which was 757 hours) despite 61 million more requests a day. That’s due to both a hardware upgrade in early 2015 as well as a lot of performance tuning inside the applications themselves. We use websockets to push real-time updates to users such as notifications in the top bar, vote counts, new nav counts, new answers and comments, and a few other bits. Fun fact: some of those browsers have been open for over 18 months. We’re not sure why. Someone should go check if those developers are still alive. This entry was posted in Computer, Hardware, Murmuring, Network, Programming, Software, WWW and tagged 2016, architecture, asp, asp.net, cisco, cloud, debug, edition, idc, microsoft, net, overflow, server, service, sql, stack, websockets on February 18, 2016 by Gea-Suan Lin. The ability to protect and accelerate WebSockets has been one of our most requested features. This entry was posted in CDN, Cloud, Computer, Murmuring, Network, Security, WWW and tagged cdn, cloudflare, ddos, protection, websockets on August 7, 2014 by Gea-Suan Lin.